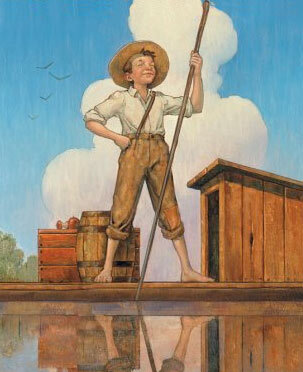 Huck Finn would have made his own fishing pole too! Mark Twain’s character, Huck Finn, was the ultimate adventure seeker. Huck knew how to make the most of every day, and every opportunity. You can bet that when spring rolled around, ole Huck would be outside on the riverbank. You may not be as free to roam as Huck, but you can spend a day lazing on the riverbank just like he did. If Huck were around today, he wouldn’t buy his fishing pole at the store – he’d make his own. He’d whittle a tree branch, attach some line, dig up a worm, and catch some dinner! Step 1: Find a tree branch that is approximately the same height as the person who will be fishing with the fishing pole. Using a pocketknife, remove all of the protruding branches and twigs so your pole is straight and smooth. STEP 2: Cut a piece of fishing line 12 inches longer than your pole. STEP 3: Using your knife, cut a groove around the tip of your fishing pole approximately ½ inch from the end. The groove needs to go all the way around the circumference of the fishing pole, and must be deep enough for you to wrap the line around three times. STEP 5: Tie a fishing hook to the end of the line. If you are fishing in a creek or river, then attach a sinker about 6 to 12 inches up the line. If you are fishing in a pond or lake, you likely won’t need a sinker. STEP 6: Dig up some worms, head out to your favorite fishing hole, and join Huck in a day of fishing, fun, and adventure! Make your own kids fishing pole AND your own wooden fishing lures. 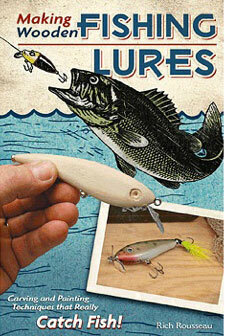 If you like the idea of making your own fishing gear, then check out the book, Making Wooden Fishing Lures. You’ll learn tips and techniques to create effective lures that you can be proud of. Another great kids fishing book that is kid-friendly, easy to read, and loaded with fun photographs and drawings, is Kids Gone Fishing. It’s one of our favorites here at JM Cremps, and it just may instill a lifelong love of fishing in your kids. If a homemade pole isn’t your thing, then JM Cremps carries a great “Huck Finn” alternative – the 3-piece 12’ Bamboo Cane Fishing Pole. It’s easy to carry, durable, and catches fish! Previous postTurn Your Kids into Slackers – With a Backyard Slackline!